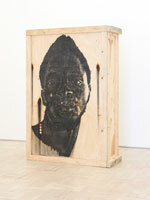 Michael Stevenson is pleased to present a new installation of drawings on crates by Serge Alain Nitegeka. 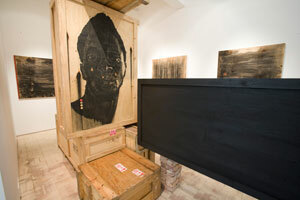 This is the second project in the side gallery series in 2009. The drawings attempt to restore personal memories of particular occurrences that were oppressive in nature. These restorations of memory situate themselves within a collective history of a people, all people indeed, who struggle to grapple with the idea of 'inherited ethnic violence'. 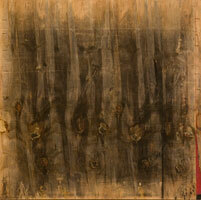 The patterns that emerge on the four panels on the wall suggest rivers, forests and deserts. With care, one can distinguish solitary figures in these landscapes, recalling the opening of Dante's Divine Comedy: "I found myself in a dark wood, for the straight road was lost." Within the grim, brooding environments, Nitegeka leaves adroit, almost seductive clues. 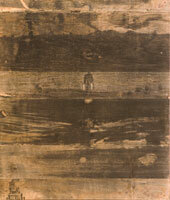 In Untitled (Landscape) II, the two nuggets of light on either side of the central figure suggest hope - this baggage could simply be water, of vital importance to prolonged travel through thinly populated areas, or it could be determination and resilience, equally important for survival. Nitegeka, born in 1983 in Burundi, is currently completing his fourth year at Wits University. 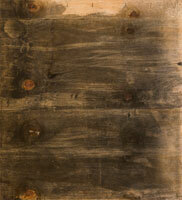 He was recently included on the exhibition Self/Not-self at Brodie/Stevenson in Johannesburg. 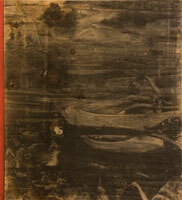 The exhibition runs concurrently with shows by Wim Botha, Simon Gush and Zineb Sedira.